The Haunted Windchimes have performed on A Prairie Home Companion, and they’ve already attracted a faithful following in the folk-blues-bluegrass-American roots underground. They deserve a faithful following because they make music worth listening to – sometimes moody and melancholy, sometimes sly and insinuating, always distinctive. 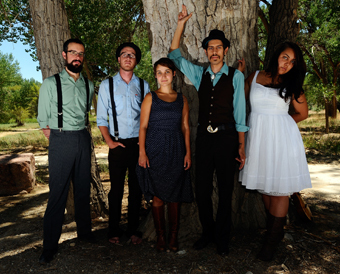 With Desirae Garcia on ukulele, Chela Lujan on banjo, Inaiah Lujan on guitar, Mike Clark on harmonica, guitar, and mandolin, and Sean Fanning on standup bass, the band plays mostly originals – but you’d almost swear you’ve heard the songs before, maybe in an abandoned roadhouse over a jug of moonshine!